Morphine, one of the most celebrated molecules in history, also happens to be one of the deadliest. It belongs to the same family of opioid compounds that includes oxycodone and heroin. So does fentanyl, a weaponized form of which is rumored to have caused havoc and killed dozens in a terrorist standoff in Russia a few years ago. Potent painkillers which mitigate pain that is impossible to cure using traditional painkillers like ibuprofen, morphine and its cousins are also devils in disguise. Constipation is the least concerning side effect of opioid use. Even in moderate doses they have a high risk of causing death from respiratory failure; in the jargon of drug science, their therapeutic index - the difference between a beneficial and a fatal dose - is very low. To get an idea of how potent these compounds are, it's sobering to know that in 2014, more than 28,000 deaths were caused by opioid overdoses, and half of these were because of prescription opioids; the addiction potential of these substances is frighteningly high. The continuing oxycodone epidemic in places like New Hampshire bears testimony to the hideous trail of death and misery that opioids can leave in their wake. Quite unsurprisingly, finding a chemical agent that has the same unique painkiller profile as morphine without the insidious side effects has been a longstanding goal in drug discovery, almost a holy grail. It would be hard to overestimate the amount of futile resources that pharmaceutical companies and academic labs alike have spent in this endeavor. It was long thought that it might be impossible to decouple morphine's good effects from its bad ones, but studies in the last few decades have provided important insights into the molecular mechanism of morphine's action that may potentially help us accomplish this goal. Morphine binds to the so-called µ-opioid receptor (MOR), one of a family of several opioid receptors involved in pain, addiction and reward pathways. The MOR is a GPCR, a family of complex seven-helix protein bundle which are ubiquitously involved in pretty much every important physiological process, from vision to neuronal regulation. Almost 30% of all drugs work by modulating the activity of GPCRs, but the problem until now has been the difficulty of obtaining atomic-level crystal structures of these proteins that would allow researchers to try out a rational drug design approach against them. All that changed with a series of breakthroughs that has allowed us to crystallize dozens of GPCRs (that particular tour de force bagged its inventors - Brian Kobilka and Robert Lefkowitz - the 2012 Nobel Prize, and I had the pleasure of interviewing Kobilka a few years ago). More recently they have crystallized the various opioid receptors, and this definitely represents a promising opportunity to find drugs against these proteins using rational drug design. When activated or inhibited by small molecules, GPCRs bind to several different proteins and engage several different biochemical pathways. Among other insights, detailed studies of GPCRs have allowed us to determine that the side effects of opioid drugs emerge mainly from engaging one particular protein called ß-arrestin. A paper published this week in Nature documents a promising effort to this end. Using computational docking, Brian Shoichet (UCSF), Bryan Roth (UNC) and their colleagues have found a molecule called PZM21 that seems to activate the MOR without also activating the molecular mechanisms which cause dangerous side effects like respiratory depression. The team started with the crystal structure of the MOR and docked about 3 million commercial lead-like molecules against it. The top 2500 entries were visually inspected, and using known data on GPCR-ligand interactions (especially knowledge of the interaction between the ligands and an aspartate - Asp 147) and sound physicochemical principles (discarding strained ligands), they narrowed down the set to about 25 ligands which gave binding affinities ranging from 2 µM - 14 µM; interestingly, along with the Asp 147 interaction, the model located another unique hydrogen bond with Asp 147 that has never been seen before in GPCR-ligand binding (compound 7 in figure above). Using traditional structure-based design that allowed the group to access novel interactions, the affinity was then improved all the way to single digit nanomolar, which is an excellent starting point for future pharmacokinetic studies. The resulting compound hit all the right endpoints in the right assays; it had greatly reduced recruitment of ß-arrestin and subsequently reduced respiratory arrest and constipation, it mitigated pain efficiently in mice and showed much lesser addiction potential. It also showed selectivity against other opioid receptor subtypes, which may make it a more targeted drug. This paper is noteworthy for several aspects, and not just for the promising result it achieved. 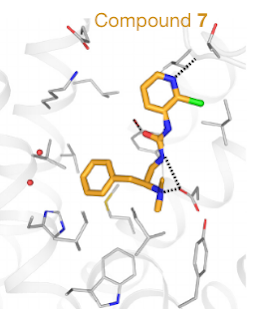 Foremost among them is the fact that a relatively straightforward docking approach was used to find a novel ligand with novel interactions for one of the most coveted and intractable protein targets in pharmacology. But to me, equally noteworthy is the fact that the group examined 2500 docked ligands to pick the right ones and discard bad ones based on chemical intuition and existing knowledge; the final 25 ligands were not just selected from the top 50 or 100. That exercise shows that no modeling can compensate for the virtues of what chemist Garland Marshall called "a functioning pair of eyes connected to a good brain", and as I have found out myself, there's really no substitute for patiently slogging through hundreds of ligands and using your chemical intuition to pick the right ones. There is little doubt that approaches such as this one will continue to find value in discovering new ligand chemistry and biology in valuable areas of pharmacology and medicine. As is becoming clear in the age of computing, the best results emerge not from computers or human beings alone, but when the two collaborate. This here is as good an example of that collaboration as I have recently seen. "Among other insights, detailed studies of GPCRs have allowed us to determine that the side effects of opioid drugs emerge mainly from engaging one particular protein called ß-arrestin." Ehhh... maybe. Trevena has had a staggeringly difficult time teasing apart side effects and main effects, and when they have, it hasn't been what you'd call perfectly orthogonal to the knockout results. I particularly liked the part where the authors admit that no matter how smart their approach was, many unique properties of the lead compound were pure luck and wouldn't be possible to predict with current tools. And if Brian Shoichet writes this, I'm pretty sure that nobody in the world can claim otherwise. As a synthetic chemist behind PZM21, I confess that its synthesis in diastereomerically pure form and - especially - figuring out its absolute configuration were quite a luck, too. Yes, I think that's the beauty of it. You can use new chemistry and modeling to discover new biology. Thank you for writing a piece that so accurately recognizes the work and thought process behind this paper.